This is the Tetragrammaton, thought by scholars to have originally been pronounced as "Yahweh." The name "Adonai" was substituted so that God's name would not be profaned (cf. Ex. 20:7; Matt. 6:9). Jehovah’s Witnesses use the name “Jehovah” as God’s personal name. That isn’t all that uncommon – a lot of folks do the same. We find that name in the King James Version, as well as the American Standard Version (1901). The problem, however, is that we do not find it in the original Hebrew text. Very few scholars use the name Jehovah because it does not appear in the Old Testament. Many people do so, however, with great reverence and respect. We must realize that the origin of the name comes from a misunderstanding on the part of early translators. They apparently did not understand the manner in which Hebrew scribes wrote the name in antiquity. The misunderstanding over God’s name seems to have arisen because of a peculiar way in which ancient scribes treated the text. They considered the consonantal text sacred and unalterable (in a word, inerrant). However, when the scribes came to a word they felt had been misspelled or miscopied, they inserted the vowels for what they believed the correct word to be. This led to a change when the text would be read aloud. The written, consonantal text, called the kethiv (from the Hebrew word kathav, meaning “to write”), could not be altered. But, the text that seemed to make more sense would be read aloud, which was called the qere (from qara’, meaning “to speak”). When we understand the difference between the kethiv and the qere, we see that the name Jehovah was never spoken by ancient Jews. 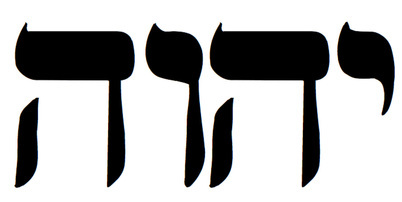 The consonants for the name Yahweh were written, but the vowels indicated that the name Adonai was to be spoken aloud. Ancient believers took great pains to ensure that the name of God was never profaned. Unlike moderns, who abuse the name of God with breathtaking regularity, the ancients did not even pronounce the covenant name of God to ensure that they would never treat it with disrespect. Instead, they used the name Adonai, or “Lord.” Modern Jews continue to follow the same practice, using either the name Adonai or Hashem (literally, “The Name”). additionally, while there is some uncertainty as to precisely how the consonants YHWH were vocalized, there is no j in classical Hebrew, and the waw was pronounced as a w, not a v as in Modern Hebrew. The name Jehovah has become a fixture in the language of believers everywhere. It is often used with deep reverence. At the same time, we might prefer that believers use the name of God as it was revealed in the Bible. While many English-speaking people today do use the name Jehovah, we should realize that no one in the ancient world ever did.